You deserve to feel good about yourself. And you will become an instant role model to your little one(s). I totally get it. I’m a mom. A pretty new mom at that. And trying to find a balance of putting my fitness at the forefront of my day while running after this new life that seems to have put my physical, emotional, and mental health out of whack, is a really tough to balance. Find Your Happy: Happy moms have happy babies and healthy moms raise healthy families–it’s the snowball effect! Just 30 minutes of exercise can increase your endorphins, lower stress, and boost your confidence. Having a bad day? Feeling the baby blues? Come get happy. No Extra Worries: Workout with your little one and you don’t have to worry about a stranger watching your child while you exercise. Personally, I have dealt with some pretty bad postpartum anxiety and I haven’t let anyone watch my baby girl except family. Working out with her has been so comforting to me because I don’t have to worry about her while I’m exercising! Your Baby, Your Resistance: Your little one will be your partner and your resistance!! Hold your baby for squats and lunges OR put him/her on your back and grab some dumbbells for added strength. There’s nothing we can’t do to make this your BEST workout for whatever level you need. Gain Back Your Confidence. Going through the physical changes of having a baby is rough on us–physically and mentally. Suddenly our bodies don’t look the same anymore and many of us have trouble facing how much we have changed! Not only will exercise help us feel better about ourselves and boost the fat loss process, but it will help us with the other changes that no one wants to talk about. Let’s learn to strengthen all our muscles and put our pieces back (as close as we can) to where they once were! Make Friends with Moms Like You. What could be better than working out with your baby? 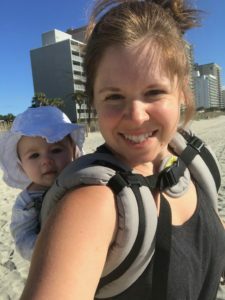 Working out with your baby and other moms with their babies! Make friends with other moms in the area and your babies can make new friends too! 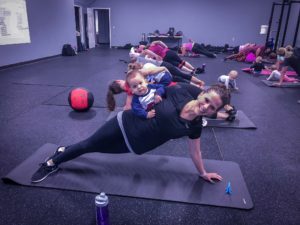 I created StrongFigure Bootcamp for several reasons, but one main reason is because I’m a mom and I want to create a place where moms can connect with one another and leave every day feeling better about themselves, their daily troubles and triumphs, and just connect with others who understand. Read more about my personal reasons for creating StrongFigure Bootcamp. Check out the SIGN-UP Page for current sessions with our resident Bootcamp Momma Instructor, Caitlin Tice. Current class time is 4:30pm on Tuesday evenings. Session Price: $70 per adult for a 6 week course. All mommas who sign up will receive a FREE 13-page Nutrition for Mommas Guide! Sign up for Mommy and Me Bootcamp Classes HERE. This session is limited to the first 25 moms who sign up!